Anyone following all the chatter in the bug ? Looks like Bug 1182546 will be backed out later today until a 'better fix' for the problem and security can be worked out. From the talk, it appears that adding the 'workaround' of contentaccessible=yes may create a data/security leak. I think they are talking about the security leak where the addon will allow a 'fingerprinting' leak in that you can be tracked from the addon leaking 'data'. I'm wondering if perhaps the advise of modifying the addon to add the 'workaround' should be put on HOLD, until which time they back the patch that started this mess. I'm also thinking that those that modified their addon to 'work' should perhaps backout the workaround once the offending patch is backed out. TheVisitor wrote: Anyone following all the chatter in the bug ? Looks like Bug 1182546 will be backed out later today until a 'better fix' for the problem and security can be worked out. Latest nightly disabled all of my add-ons. Anyway to fix this? mancode20 wrote: Latest nightly disabled all of my add-ons. Anyway to fix this? Speed Dial [FVD] seems to be broken in the latest nightly. Add-ons that restore the version number are broken by latest Nightly. If you are using one of them, disable them (restore an older Nightly build first). If you are using CTR, you still can access options window and disable the version number option. I disabled the add-on, Add-On Manager Version Number 1.0.7, but the problem is still there. I have updated to the latest Nightly thinking that maybe it would be fixed, but no such luck yet. Will this be fixed in an upcoming update? How do I get my add-ons back? I probably wouldn't even use Nightly anymore, if I could get E10s to work in Beta, which I have also been unable to do. I set browser.tabs.remote.force-enable to true, but it's still not working. What else do I have to set? @ mancode20 - Extensions devs need to fix it on their side. Use stable or ESR build. Nightly is a pre-alpha build, where things can break. I can not confirm your issue. 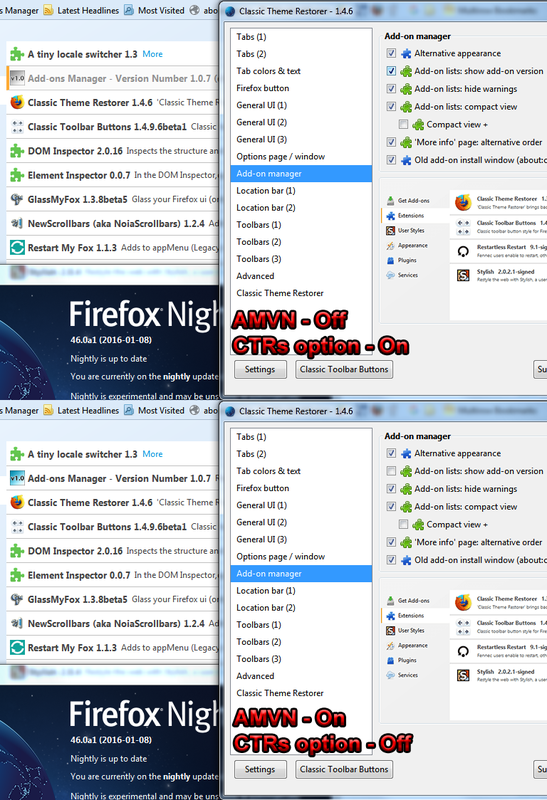 CTR 1.4.6 version number option and "Add-ons Manager - Version Number" 1.0.7 work fine with latest Nighty builds. Make sure you test on a new browser profile to verify. Maybe another add-on interferes on your system. Turns out that's not the issue. The issue is that user styles are gone. I have Stylish installed, but my custom user styles are gone and the ability to even change user styles doesn't exist anymore. Have they removed them permanently? Stylish is broken in Nightly. Use Firefox release, beta or developer edition, if you need Stylish. Will Stylish be fixed in Nightly? I hope so! Aris wrote: Stylish is broken in Nightly. Use Firefox release, beta or developer edition, if you need Stylish. Please, NO comments in bug. Appears there is a work-around, but I have no idea what to do with the code that was posted on the AMO page - comments area.